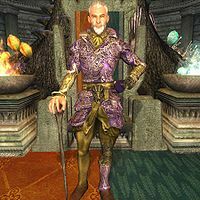 Sheogorath é o Príncipe Daedrico da Loucura, o Quarto Canto da Casa dos Problemas, Lorde do Nunca-Lá e Soberano das Ilhas Calafrosas. [nb 1] Diz-se que suas motivações são desconhecíveis. É muitas vezes chamado de Estrela Louca, o Lorde Louco, o Doido, e o Deus Louco, entre outros. His realm, best known as the Shivering Isles, has also been called the Madhouse. It's believed that those who go there lose their sanity forever. [nb 2] Of course, only the Mad God himself may decide who has the privilege to enter. The Golden Saints, or Aureals, and Dark Seducers, or Mazken, are his servants. The Mad God typically manifests on Nirn as a seemingly harmless, well-dressed man often carrying a cane, a guise so prevalent it has actually been coined "Gentleman With a Cane". 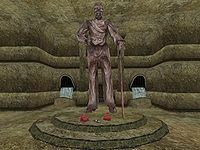 Worship of Sheogorath is widespread in Tamriel, but historically, he has been especially revered in Morrowind and Elsweyr. The Chimer revered Sheogorath in their ancient ancestral worship. However, when the Tribunal Temple took power in Morrowind, Sheogorath, as well as Mehrunes Dagon, Malacath, and Molag Bal, became known as one of the "Four Corners of the House of Troubles" to the Dunmer. 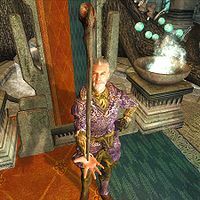 He is said to have rebelled against the Tribunal, and this is why worship of Sheogorath became punishable by death. [nb 5] Nevertheless, Vivec apparently made an agreement with Sheogorath to protect his people from madness, an agreement the Dunmer must occasionally renew by performing the Pilgrimages of the Four Corners. Sheogorath's shrines were abandoned, but many have remained standing into modern times. Legends say Daedra Lords such as Sheogorath built the great shrines themselves because mortals could not build anything grand enough to suit them. 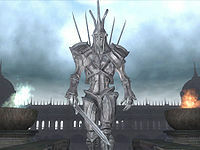 The Champion of Cyrodiil reportedly ended the cycle by defeating Jyggalag during the Greymarch at the end of the Third Era. This released Jyggalag from his curse, allowing him to remain in his true form instead of transforming back into Sheogorath. After defeating Jyggalag, the Champion of Cyrodiil became Sheogorath. The "Gentleman With a Cane" continues to stroll through Tamriel, and, as always, one can never be sure what his visits will bring. In the Merethic Era, Sheogorath paid a visit to the Dragon Priest Korthor in Vuldngrav, during the time of the Dragon Cult in Skyrim. The Mad God "lost" the Fork during this visit, and Korthor was later entombed in Vuldngrav with it. In 2E 582, Arch-Mage Shalidor and the Vestige recovered the Fork from Korthor during one of Sheogorath's trials. The glove Gambolpuddy makes the wearer both stronger and weaker. 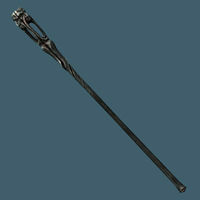 It was last seen in the city of Ald Daedroth in Morrowind. At the end of the Third Era, a mysterious portal opened on an island in Niben Bay which led to the Isles. The realm was reported to be similar to other societies in Tamriel - but with obvious and glaring exceptions, of course. The mentally ill, bifurcated populous held a range of beliefs about Sheogorath. Some zealots revered him as a living god, while others, labeled heretics, thought he was nothing more than a mortal impostor. Some urged armed uprising, and many committed various deranged acts in attempts to gain his favor. 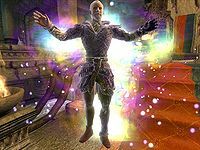 ^ The 36 Lessons of Vivec, Sermon 33 seems to be an allegorical retelling of the events recounted in The Pilgrim's Path, wherein Sheogorath tricked Baar Dau, later named the "Ministry of Truth", into flinging itself at the city of Vivec. If this is the case, Sheogorath is represented in the Sermon by the "Void Ghost". Notably, the Void Ghost was found within the "Scaled Blanket" (apparently referring to the constellation of the Serpent). Vivec wrote that bargains with the Ghost were only for "ruling kings". The Ghost also met Nerevar, though most of their meeting is omitted. For game-specific information, see the Daggerfall, Morrowind, Oblivion, Shivering Isles, Skyrim, and ESO articles. ^ a b Sheogorath's dialogue in Skyrim. ^ Diálogo de Tholer Saryoni em Morrowind. ^ a b Diálogo de Sinnammu Mirpal em Morrowind. ^ a b c d Sheogorath's dialogue in Shivering Isles. ^ Dunmer dialogue in Morrowind. Esta página foi modificada pela última vez à(s) 14h27min de 15 de novembro de 2017.